This First Watch® Blue Ridge Electronic Lock Fire-resistant 48-gun Safe allows you to follow the gun owner rules of safety first and safety always. Rest easy knowing your valuable collection is out of reach from unwanted hands and protected from unforeseen circumstances. The interior is lined with a fire-retardant carpet and the exterior is fire-resistant to 1,400° for 45 minutes. Inside are 8 adjustable shelves for accessories and an 18-pouch organizer on the door to hold 8 handguns. 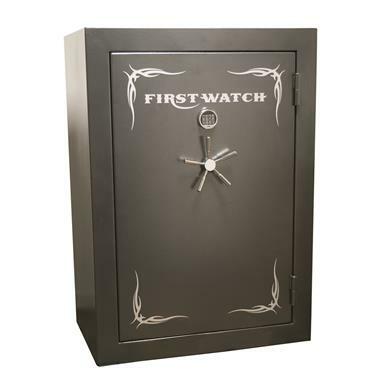 Overall this Fire-Resistant Electronic Lock Gun Safe offers 29.7 cu. ft of storage for up to 48 guns. The solid steel construction has a 3.2 mil epoxy-polyester powder coat finish and 4-way locking system with 7 live-action and 4 stationary 1.5" diameter bolts. The door is secured by an electronic lock key pad with retractable USB Entry and Manual Override Keys and a chrome-plated spoke lever for easy opening. All steel construction has a 3.2 mil epoxy-polyester powder coat finish for generations of use. Note: This item is shipped by commercial carrier curbside. Unloading is the customer's responsibility, including off the back of the truck. This product ships in one box, measuring 64.59"l. x 43.40"w. x 30.40"h. and weighing approx. 906 lbs. No expedited delivery. High-value orders require a physical street address, otherwise insurance costs will be added to the shipping total. Exterior dimensions: 42" x 27" x 59"h.
Interior dimensions: 39"x 23.5" x 56"h.